Binge eating and emotional eating may share similar patterns but can vary greatly among individuals. I used to believe that binge eating and emotional eating were pretty much the same thing, but I now I have changed my mind. Many women display both forms of compulsive overeating which make them harder to differentiate. The path to normal eating is different for each. I have already covered each type of food addiction at emotional eating and binge eating separately, but I want to do a quick overview to help you assess what to do in your specific situation. I believe that the one of the main binge eating causes is what I call the “diet mentality”. It’s been scientifically proven than most diets fail long-term and that only 2% to 5% of people lose weight long-term dieting. Yet, weight-loss experts still manage to sell the idea that dieting is the answer to weight-loss, even after decades of failure. They often blame you for not doing it right or binging in secret. They say cravings are not normal and that if you had the willpower you would see that they are right. I’ll go over some of their biggest myths here and hopefully set you free from their lies. Also, I’ve decided to include in binge eating, everything that motivates you to keep on dieting. Forbidden foods also form part of what I call the “diet mentality”. If you want to recover from binge eating, accept that you can eat whatever you want. I am tempted to say that there are many ‘foods’ I don’t consider to be food and I’m reluctant to eat those things. I do my best to stay away from them, but they are not forbidden. It’s just that I prefer to feed my body with unprocessed foods and that flashy purple candy looks like plastic to me, rather than food. That’s another pitfall of the ever-growing weight loss business. This will cause you to crave the real food. Such cravings will lead to more binging episodes. Food you don’t cook yourself usually contains sugar and additives that are supposed to increase your satisfaction. These foods are designed to make you want more of them and crave foods that will create more cravings and binges. Also, if you don’t eat enough, you’ll be hungry. Hunger will become stronger and stronger until you can repress it no longer and find yourself rushing to the kitchen or the deli and end up eating whatever you can lay your hands on. The only solution to this is to find manageable ways of eating sufficent fresh food when you’re hungry; nourishing food that doesn’t make you crave more food within an hour. This will cure binge eating in the long term but will have very little or no impact on emotional eating. This may also be a result of being an over-giver or managing your life in a way that doesn’t leave enough time for you to take care of yourself. In this case, you may need to address those issues with a coach or a therapist to fully overcome binge eating. The next two points are borderline between emotional eating and binge eating but I’ve decided to place them under binge eating anyway, because I feel they are related to feelings more than emotions. If somehow, someone has convinced you that you’re not acceptable the way you are, that you must diet to ‘fit in’, you may be tempted to diet compulsively. You then oscillate between very restrictive diets, new fad diets, fasting and other ways that are supposed to make you lose weight super fast. At times it will feel like you’re holding your breath and that you’re slowly dying. At some point you may eat some of the foods in your “wrong or forbidden food” list. You may feel bad or guilty at “falling off the wagon”, but at this point, you just need some air. You’re suffocating and you’ve just given up. You don’t want to be bothered with so much restriction any more. You’ve had it, so you start binging. For example, I know someone who thinks that “fat people don’t deserve to be happy” and that they are “inferior beings”. She considers herself to be fat even though she’s not. She feels superior to people fatter than herself and inferior to thinner women. She’s constantly dissatisfied with her looks. She deprives herself of the joy of eating. Eating becomes a source of stress because she’s constantly thinking of how the food she eats will affect her body. I can’t really call this emotional eating, which is more a way to manage emotions, but it’s still something that can cause quite some internal turmoil. Having a thin body becomes the Holy Grail; a way to give yourself value. One of the most obvious symptoms is feeling good when your scales tell you that you have lost some weight and awful when you see you have gained some; even a little. 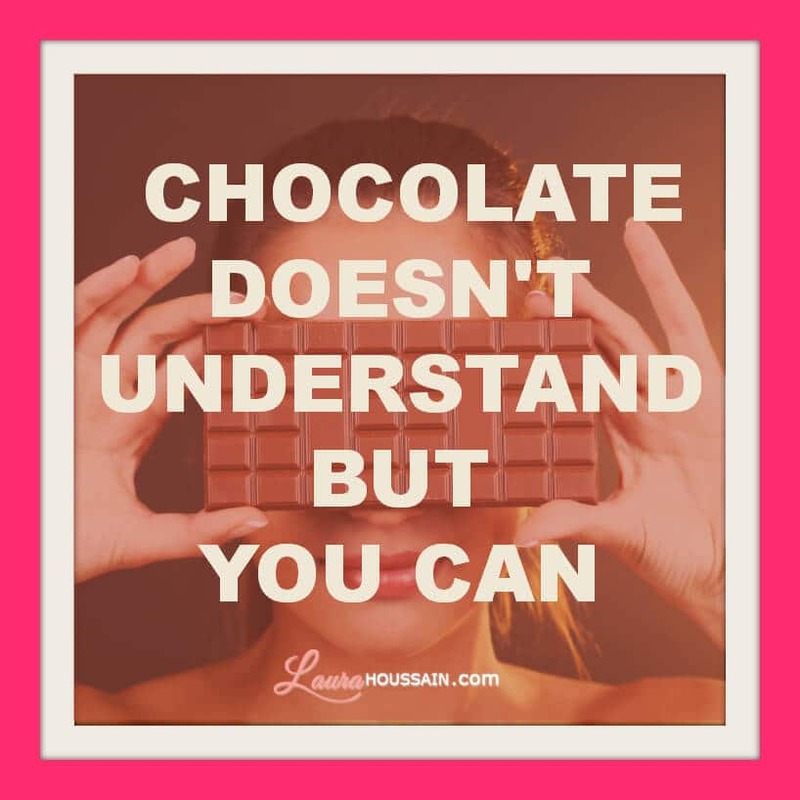 This attitude often leads to binge eating as a result of compulsive dieting and emotional eating in an attempt to soothe feelings of rejection and unworthiness. Sometimes, someone has felt overweight for so long that he or she may not feel himself or herself without the weight. Also, some people may have beliefs like “I won’t be bullied or raped if I stay overweight”. The layer of extra fat around their body then becomes their armor; a way to protect themselves from an outside world that seems potentially threatening. In this scenario, your need for safety or comfortable familiarity will make you sabotage any attempt to lose weight. During my training in Matrix Reimprinting, one of the techniques I use in my coaching, my teacher talked about women who didn’t lose weight even if they fasted for days. They eventually lost weight after resolving past traumas and the accompanying belief that losing weight wasn’t safe. As long as you perceive a hidden advantage in keeping yourself overweight, your dieting efforts will inevitably lead to binge eating. You may lose weight for a short while, and that may make you feel really happy, but before you know it, you find yourself eating lots of food uncontrollably. In such a situation, coaching or therapy is required. I usually get great results with most people quickly, but self-image and safety issues inevitably lead to relapses. Once these past issues are lifted, weight-loss becomes permanent. Guilt may be present in both binge eating and emotional eating. However, binge eaters tend to feel more guilt. Overeaters who eat too much food regularly may not feel guilty at all, but feel very bad about their body or fear side-effects on their health. To me, overeating is a chronic emotional eating condition. Food becomes a very important part of someone’s life. It serves as a constant band aid, and a distraction for their feelings. So guilt may be present in both forms of food addiction, but is not always present for emotional eaters. Below, are most common emotional eating causes. As you’ll see, emotional eating serves to either soothe or to suppress emotions. Eating becomes disconnected from hunger.Whether you use it to lift your mood or avoid feeling unpleasant emotions, you use food and your body’s chemical reaction to it to regulate your emotional state, not to feed your body. I fit that description perfectly. I used to eat to suppress home-sickness. I know other people who eat out of nostalgia. Food becomes a way to connect to a lost person or situation. Usually, the foods you choose are directly related to the foods you ate at that time. You may also feel that you are not fulfilling your dreams or you don’t have the resources to make things happen in your life. Eating becomes a way to compensate for the loss of your dream life. It’s a symptom of settling for less through lack of faith in yourself, or being or feeling trapped in some way. You can recover from both by grieving and letting go of what is lost, giving yourself a chance to take action and focusing on making your life a better place for you. This may need some “internal reprogramming”, but it can be done quite quickly. You set new beliefs about what you can achieve and you focus on creating a new situation that will bring you what you feel you’re missing. You try to be there for everyone but yourself. I used to be a love addict and it’s still hard sometimes to say no to others to keep time for myself. If this is your situation, you’ll have to readjust your schedule so that you include some “me time”, with loads of fun and excitement. Soon, you won’t need food as much because you will be addressing your underlying needs to give yourself time. This is usually the most common factor. Whether you feel lonely, frustrated, scared, stressed out or sad, eating becomes a way to cope with your emotions. Foods create a pleasure signal in your brain and you temporarily feel better. But then overeating guilt often sets in and you may end up eating to suppress that as well. This is a variation of the above scenarios, except that this time you just want to suppress your emotions and feel better. You then use food as a drug to modulate your mood. You may not even be aware of your emotions, just feel you need something to eat. Stopping emotional eating usually requires taking the time to observe and welcome emotions instead of suppressing them with food. Emotional eating often stems from a feeling that you can’t take care of yourself or that there is nothing you can do about a situation. In this case, your only obvious option is to ignore the situation and the emotions that come with it. You just eat to comfort yourself. For example, I ate cookies and ice-cream to ignore the fact that my marriage was failing and my husband was cheating on me. I could sense something was wrong, but I used food and denial to emotionally avoid the situation. As a former love addict, this man seemed to be my only option. I had such low self-esteem, I didn’t think another man would ever want me so I was holding on to this one for dear life, no matter how toxic our relationship had become. One of my clients suffers from a similar situation. She loves someone who is already married. When she sees him happy with his wife, she feels like running to the kitchen. To stop emotional eating, you need to learn to question why you want to eat: “Is it hunger? Is eating what I truly need right now?” and learn to welcome your emotions. I have described the process in my article “how to stop emotional eating”. In the above example, both my client and I needed to address the fact we were lacking love in our life. For me, the obvious course would have been to try and save my relationship first and if that failed, accept the fact, and leave the relationship to find a better one. But because I didn’t believe I could have a better one, I stayed, and I ate. So the secret is always to find the story behind the emotions and challenge it. I have created a simple method for doing this that can give results in as few as 30 days, with less than 18 minutes a day. I often hear my clients say they believe that they will never feel good enough. Somehow, they hear a voice in their head saying “you’re unworthy”, “your body is ugly”… That voice often leads them to try and achieve perfection in order to feel acceptable. This kind of attitude creates unbelievable amounts of stress. It may lead to dieting and binge eating and also stress eating or mindless eating. Changing beliefs and expectations about yourself to healthier ones will drastically reduce the levels of stress in your life. I don’t think this may always be necessary to overcome emotional eating, but addressing it brings with it the opportunity to improve all aspects of your life. I have struggled with low self-esteem most of my life. Here is how I have rebuilt my self-confidence. We may also attempt to eat to feel less lonely. I know I used to do that when I was home-sick. I would brainwash myself in front of TV munching on some cookies. All this distraction made me feel less alone. Instead I could have gone out, tried to connect with others, learnt how to express my feelings and have a magnetic personality, but food seemed like a more reachable and familiar solution at the time. I see now, how food was not my friend but rather a poison that was keeping me safe and small and miles away from my dream life. The only way to feel less lonely is to learn how to connect to yourself. Sometimes other people are unavailable or in a bad mood. Then all you have left is your ability to feel at ease in your skin until things look up. I have already covered this issue in my article about emotional eating so I will not cover it here. In short, depression is another expression of powerlessness, or the feeling that there is no way out of your situation. If you often feel sad or if you feel overly sensitive and negative, read my article about how to stop overeating and beat depression at the same time now. This is another situation in which you may be tempted to eat because you feel powerless to handle your relationship with others in an assertive way. You may end up doing too much and depriving yourself of pleasure and quality time for yourself. Once again, eating becomes a quick fix that stimulates your brain’s pleasure center without taking up too much of your time. It’s some sort of patch that prevents you from asserting yourself and getting what you want in life. As you may understand by now, overcoming emotional eating disorder requires much more than changing your diet, going for a walk or calling a friend when you’re not well. Fortunately, most of the points I have covered above can be resolved by using the same method. If you apply it diligently, not only will you get over emotional eating, you’ll feel self-confident enough to go after your dreams. It’s a very empowering process, that will take you away from the feeling of being trapped and the need to fix your emotions with food. It becomes much easier to eliminate binge eating once emotional eating has been addressed. 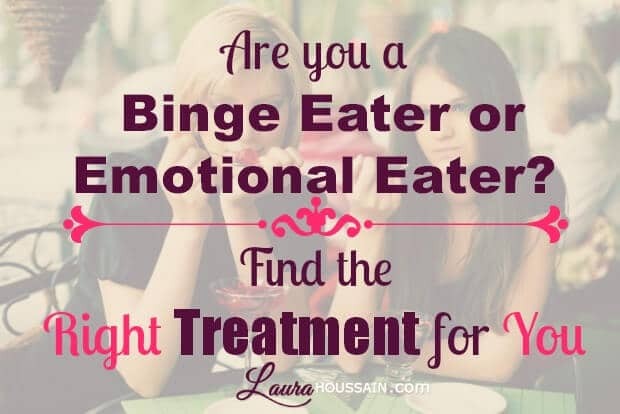 Binge eaters who don’t suffer from emotional eating can recover quite quickly by learning how to eat only out of hunger and relinquishing dieting for ever. It’s a rather easy process once they give up counting calories and forget all the dieting tricks they’ve learned. Emotional eaters will need to learn to handle emotions differently. This may take some trial and error, but recovery can be permanent in as few as 30 days. I hope you have found this article helpful. Please leave your comments below and share your opinion and story with the community.